Now that macOS Mojave has arrived on our Macs, bringing key iOS apps like News and Stocks to the fold, Apple’s OS is better than ever. This update also brings a system-wide Dark Mode and increased productivity through Finder. Apple has hinted that more iOS apps will be making their way to the best Macs in the coming years, but there’s already a lot to love. And while macOS Mojave has faced its own fair share of security issues, namely KeySteal – a security exploit that makes your Keychain passwords vulnerable – the operating system is generally safe and stable. Apple’s macOS Mojave has been on our Macs for more than six months now, and most, if not all, of the problems have been fixed. And, any problems that remain are outweighed by the benefits. So, now that we have macOS Mojave, we’re going to dive into all the features the new OS offers, along with any new features that are added, so you can decide whether you should upgrade or not. Learn how to download and install macOS 10.14 Mojave right here. Apple announced macOS Mojave back in June 2018 at WWDC 2018, where most of the features were detailed. This was followed by a public beta launch back in July, then finally the macOS Mojave launch on September 24 2018. Apple is keeping macOS Mojave updated with all the latest features. The latest of these updates, macOS 10.14.4 brings Dark Mode to Safari, along with the new Apple News+ service. Past updates included a fix to the FaceTime Bug that allowed people to access your camera without you answering their call, and a supplemental update, boosting reliability for the 2018 MacBook Air. Apple has also seeded the second beta of macOS 10.14.5. We’re not sure what’s included in this Beta quite yet, but you can be sure that performance updates and bug fixes will be included. We should see this update go live within the next month or so. Keep it tuned, because we will keep this section updated with all the newest updates as they release. So, now that macOS Mojave has been out for a while, there are a ton of new features available to your Mac. And, we’re going to dive into a detailed overview of everything your Mac can do. From Finder improvements to more rigid security, the best Macs are about to become a lot better. Read on to discover all the new features coming to your Mac when you update to macOS Mojave. 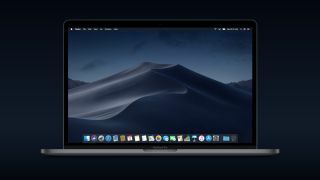 Apple’s macOS Mojave introduces a system-wide dark mode, which will extend to every first-party program on your Mac. Even Xcode gets a full makeover, completely in black, making those extended programming sessions more comfortable for your eyes. Third party programs will also be adopting this new theme, with changes happening automatically for any app that uses standard colors through AppKit. Even developers that don’t use AppKit are working on bringing Dark Mode to their programs. For example, in a recent bug report, Google Chrome developers confirmed they’re working on a way to implement Dark Mode into the hugely popular web browser – they just have some issues to iron out first. Initially shown as part of the initial release of MacOS Mojave, Group FaceTime has finally been released as part of macOS 10.14.1. This feature allows you to have FaceTime conversations with up to 32 people across iOS and macOS devices. This feature is implemented in a way that makes it extremely intuitive in macOS Mojave. You can start a group FaceTime chat from any group iMessage thread, and invites will be sent via a ringless notification, so you won’t be disruptive. Once you’re in a Group FaceTime Chat, it will automatically detect whoever’s speaking and bring them front and center, so that you’re always looking at the person actively speaking. If your desktop starts to look like a virtual hurricane blew through it after a full day of work like ours does, your days of cluttered desktops end with macOS Mojave. With Stacks, macOS Mojave will sort similar files together so that you have a less cluttered desktop – photos with photos, pdfs with pdfs – it’s great. You’re even able to scrub through thumbnails with a two-finger scroll, so that you can make sure the file you’re looking for is actually in the stack. In macOS 10.14 Mojave, Apple has added a new Gallery View to Finder. This will let you quickly browse through, annotate and edit files. No matter what kind of file you select, you'll be able to quickly and easily find exactly what you're looking for. This is made even easier, thanks to Apple adding a very detailed metadata display to the Preview pane. This makes it easier than ever before to take note of all the information of any file on your Mac. And, thanks to the inclusion of Quick Actions in the Preview pane, you won’t even need to leave Finder to work on files. You should be able to edit images, add protection to files and more. You can even assign Automator tasks as Quick Actions to make browsing through files even easier. Have you ever found yourself working on a project, and you needed to implement a document or a photo? Well, with Continuity Camera, it’s easier than ever to do just that. Across a multitude of different apps, like Numbers and Pages, you’ll be able to simply Control + Click in the body of the document, and select “Take Photo” or “Scan Documents.” It’ll then open the camera on your iPhone or iPad, where you’ll be able to take a photo and instantly pop it right into what you’re working on. It’s smooth, it’s convenient, and it’s going to be a boon for anyone that needs to save some time while doing schoolwork or that next big project. Quick Look is already an easy way to look at files quickly, and in macOS Mojave, you'll be able to quickly and efficiently use Markup to edit files you open in Quick Look. Markup is also implemented into screenshots. You’ll be able to bring up any screenshot and instantly edit any content within. Being able to quickly crop screenshots in macOS Mojave without any third-party photo-editing software is going to be a huge time-saver. Once you capture a screen, you’ll see a preview image open up, similar to iOS 12, which you can click to preview and edit your screenshot. That's not all though, Screenshots are still a simple shortcut away, but with macOS Mojave, a new easy-to-use menu includes screen-recording tools, so that you can capture animated content. And, perhaps most importantly, you can choose to save the screenshot to your clipboard, saving time if you just need to send someone a quick screenshot. Apple News, Stocks, Voice Memos and Home are all brought over from iOS to macOS Mojave, with special care given to reformatting them to fit your computer. These apps leverage the power of the best Macs to deliver an awesome experience. Voice Memos, for instance, will automatically transfer any memos you take between your iOS and macOS devices – rewarding anyone who utilizes the ‘Apple Ecosystem’. This isn’t a full iOS app migration, though. In fact, since these apps are specially redesigned for macOS, they feel like new Apps. Plus, the new Apple News+ service is available on Mac the same day as iOS. Apple did say that it’d be bringing more iOS apps to Macs this year, so we’ll just have to wait until WWDC 2019. Apple is concerned about your device security, and now macOS Mojave asks for permission with more features, now including the camera and microphone. Mojave’s security also provides more robust protection for your file system. Safari also has its own share of security enhancements, shutting down cookies that track you across websites, making sure Safari asks permission before it allows cookies of any kind to access your browsing data. This even includes those annoying social buttons that mysteriously appear on every page – Facebook and Twitter can’t track your activity outside of their own websites unless you grant them permission to. The App store has been a macOS staple for years now, but it always seemed a little out of place. That all changes with macOS Mojave. Apple has completely refreshed the Mac App Store, and it’s now designed exclusively for the best Macs. Not only does it look great, but it also lets you browse through apps depending on what you’re trying to install. If you’re looking for an affordable alternative to Logic Pro X or Adobe Photoshop, it’s simple to find the best Mac apps for you. The new Mac App Store also adopts the iOS App Store’s approach to editorializing its content. It’ll now have a much more modern interface with featured apps getting tutorials, spotlights and other such content. It really does bring the Mac App Store into the modern age. And, perhaps more exciting is that a ton of third-party developers, like Adobe and Microsoft, are bringing their apps to the Mac App Store, so you don't’ have to go through dodgy websites to get the apps you need. Unfortunately, with all these new features, some older Macs will have to go without updating to macOS Mojave. This is a departure from macOS High Sierra, which basically had the same requirements as macOS 10.12. See how macOS 10.14 Mojave stacks up against Microsoft's Windows 10 October 2018 Update right here. First off, macOS 10.14 requires at least 14.3GB of hard drive space for the installation, as that’s what was required last year. To keep it on the safe side, make it 20GB. However, macOS Mojave requires more powerful hardware than High Sierra. macOS 10.13 required at least 2GB of RAM and OS X 10.8 or later – that’s not the case anymore. These are the Macs supported by macOS 10.14 Mojave. Unfortunately, while the required models rarely change year over year, they have with macOS 10.14, so if you have an older MacBook, you might need to upgrade to enjoy this new version of the OS.